Not to be confused with the Taku River Tlingit First Nation in British Columbia. The Taku are an Alaskan Native people, a ḵwáan or geographic subdivision of the Tlingit, known in their own language as the Tʼaaḵu Ḵwáan or "Geese Flood Upriver Tribe". The Taku lived along the northwestern coast of North America, in the area that is now the Alexander Archipelago of Alaska, and on the lower basin of the Taku River of the adjoining British Columbia mainland above that river's mouth. Resting place of several members of the Taku Indians' Raven Clan on Juneau, Alaska's Douglas Island. The main village of the Taku people was located up the Taku River in what is now the Canadian province of British Columbia. From this main winter village they dispersed to their clan subsistence areas during the spring, summer, and fall. 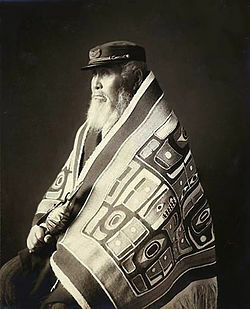 Having a keen appreciation of the advantages of their position for trade, the Taku held possession of the main river in the area that is now Juneau and compelled the natives of the interior territories to use them as middle-men, instead of allowing trade directly with the white settlers. In the early 1840s, the Hudson's Bay Company established a trading post called Fort Durham in Taku Harbor. This fort was built to take advantage of the trade route up and down the Taku River. With the establishment of the fort, the Taku people abandoned their traditional winter village and moved to the area around the fort. Although Fort Durham was abandoned by 1843 as unprofitable, the Taku stayed in the area of the fort until 1880 when gold was discovered in Juneau. The Taku people then moved to the area around Sheep Creek to work with the miners for wages. ^ a b "Background - Native Culture". Historic Preservation Program, Juneau History, City and Borough of Juneau, Alaska (Juneau Public Libraries, 2003). Retrieved 2007-05-19. ^ Muir, J. "Travels in Alaska". www.kcd.com (Houghton Mifflin Company, 1915). Archived from the original on 2007-04-19. Retrieved 2007-05-19.